Beer and cheese produce a splendid fusion of flavors in the mouth. The carbonation and sweet malt character of a fine beer compliment the texture of cheeses. Who says that wine is best with cheese? Wine has acidity that overwhelms the creaminess of cheese and washes the cheese coating (and flavor) quickly off the tongue. Beer nurtures the flavors of the cheese in the mouth and produces quite an interesting array of remarkable combinations. The wide range of world beer styles offers delightful compliments and contrasts to a variety of cheeses. A beer that is lighter in body and flavor would be a perfect marriage to a mild, mellow cheese, and a dark, rich ale would stand up well to a heavier, more pungent cheese. Beer and cheese from the same country also tend to work well together. If it is popular to have a certain style of wine with a certain type of cheese, give some thought to which beer may be a close approximation to that wine. Since herbal Sauvignon Blanc wines are often consumed with a Chevre goat cheese, try a tart, refreshing beer (perhaps with some wheat character) with this cheese. Chevre boasts a tart, earthy character that matches well with a sour Belgian Gueuze Lambics like Cantillon or a rustic Belgian farmhouse wheat ale such as Saison Dupont. These beers have tart, complex, earthy qualities that make a nice counterpart to similar flavors in the cheese. Try a Pilsner Urquell beer with a mellow white Cheddar cheese and experience a beautiful blend of mild, butter-like flavors in the mouth. It makes perfect sense that the Pilsner style of lager beer that is so popular around the world would go so well with one of the world's most well known lighter cheeses. Asiago is a wonderful cheese that is experiencing new notoriety in cooking circles. Asiago is a semifirm Italian cow's milk cheese that exhibits a somewhat nutty flavor. Nibble on some Asiago while sipping a Samuel Smith Nut Brown Ale or Newcastle Brown Ale for a flavor blend that is close to perfection. Some Asiago can be quite sharp with its strong aroma and flavor, and the malty brown ales tend to mellow the cheese. Gruyere is a creamy, unpasteurized cheese from Switzerland with a flavor that tends to start out somewhat light and fruity and end up sweet and earthy. German beers such as Paulaner Oktoberfest or a Double Bock like Celebrator or Optimator are also sweet with toasty, earthy notes and would be a smart match to the flavor of Gruyere. If the floral, fruity flavors of a Chardonnay cleanse the palate after a taste of rich Brie or Camembert cheese, it follows that a Belgian golden ale like Duvel or Westmalle Tripel would accomplish the same purpose. These pale beers have spicy, fruity flavors produced by their yeast that are in lovely opposition to the thick, rich, pungent nature of French Brie. Brie, considered to be a nice dessert cheese, can also go quite well with a dark, espresso-like Stout like bottled Guinness. Some beer and cheese combinations can be very obvious. The flavors of Chimay Grand Reserve Trappist Ale and Chimay Trappist Cheese (both made by monks in a southern Belgian abbey) together on the palate are inspiring enough to almost make one want to become a monk. 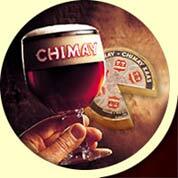 This creamy cheese is actually soaked in the Chimay beer, and together the cheese and beer reach a new level of flavor and complexity with undertones of dark fruit, nuts, allspice, and clove. What could be better than a dry, spicy, mineral-like India Pale Ale with a dry, spicy, salty Parmigiano Reggiano? Be sure to choose authentic Italian Parmigiano that is an unpasteurized, hard cheese made from skimmed cow's milk. The aroma of this cheese is fruity, and the flavor is definitely piquant. A chunk of this noble cheese and the hop bitterness and flavor of a fresh Sweetwater IPA or Anchor Liberty Ale make for a superb summer admixture. Mascarpone is a creamy, buttery Italian soft cheese made in much the same way as yogurt. It is added to desserts and flavored with other ingredients or spread on toast. Mix a bit of chocolate syrup, molasses, or maple syrup with the Mascarpone, spread it on bread or a cracker, and eat it along with a Rogue Chocolate Stout or Brooklyn Black Chocolate Stout. The chocolate and coffee flavors of the dark beer with the cheese will seem like chocolate cream pie on the tongue. If a opulent Port wine is needed to stand up to the intense flavors of English Stilton cheese, then a Barleywine (a beer made to wine-like strength) should also do the job. Stilton is a ripened blue cheese with veins of sharp mold running throughout. Roquefort and Gorgonzola are similar. The plum, raisin, toffee, and heavy malt components of a fine English Barleywine (Young’s Old Nick or Fuller’s Vintage Ale) meld into an extravagant symphony with these cheeses. Be sure to save this combination until late in the evening (to save the tastebuds) if sampling several beers and cheeses in one sitting. Experiment with different beers and cheeses and find complex, unified combinations that suit your palate. Search out top quality cheeses and pair them with fresh, craft brewed beers. Have some friends over for a beer and cheese tasting of your own. Some people may have a "wine and cheese bias" but it is almost guaranteed that after sampling these fine brews and elegant cheeses any bias will surely crumble.